What Will You Read in 2014? All day long, I’ve done what I could only dream about doing this time last year: I’ve sat on the couch reading a good book. Last December, I yearned for some good fiction after a few months of reading a bunch of how-to and reference materials. So at the close of the year, I looked over the books in my personal library and made a list of titles I hoped to read in 2013. It was a pretty ambitious list, one that I knew I probably wouldn’t finish, but I took a good stab at it. I did read seven of the fourteen books from my list, plus an additional ten that I hadn’t planned on reading. So when thinking about my book list for the upcoming year, I waited until after Christmas. I can always count on someone to come through with a great book or three, and I had a sneaking suspicion (mainly because he asked me right out what I wanted) that my husband would get me Veronica Roth’s Divergent. I wasn’t disappointed. I went ahead and bought the next two books – and it’s a good thing. I started reading it this morning and am already more than 140 pages in – I’ll be done before 2014. In addition, an unexpected gift was a book of Mark Twain’s writings from my friend Georgene. I promised that I would quote it a bunch this year, so that’s on the list. Also, my aunt ordered Bess Streeter Aldrich’s The Rim of the Prairie for me, a book I’ve read before, but alas, it was borrowed. 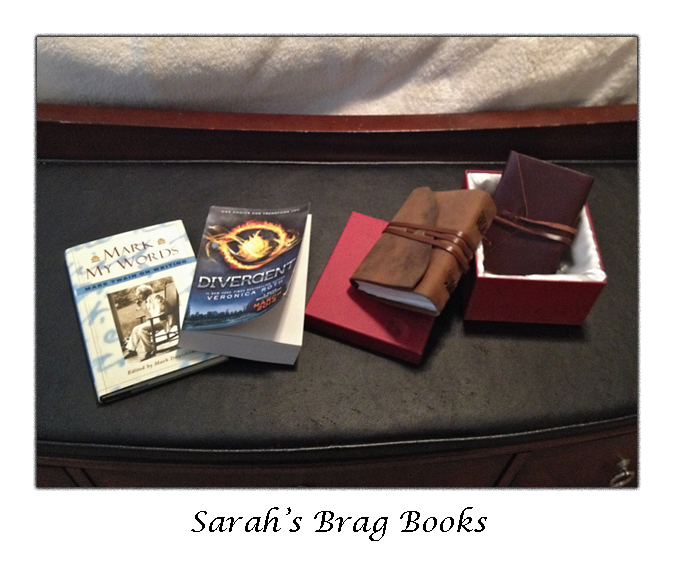 Also (and I’m bragging now), I received two books that are a writer’s best friend – hand-crafted, leather-bound blank books. My sister-in-law convinced my husband to splurge on one (thank you! ), and my aunt bought the other – they know me so well. When I’m not reading, I’m usually writing, and I can’t wait to fill them. This year’s list will be composed of three kinds of books – the ones I still have to read from the 2013 list, books that I want to re-read, and brand new ones. And, as happened this year, I am sure that other books will pop into my life and expand my literary horizons still further. Click on the links below to read more about these books, and if you purchase one from one of my links, you’ll support my blog. Wheat Belly: Lose the Wheat, Lose the Weight, and Find Your Path Back to Health by William Davis, M.D. The Coconut Oil Miracle, 5th Edition by Bruce Fife, C.N., N.D.
Do I really think I’ll finish all these books? Not a chance. (I still do have to feed my kids and clean the house, after all.) But it will be fun trying. What books do you plan to tackle in the new year? Happy reading! This entry was posted in About the Writer Mom, Odds and Ends and tagged Artemis Fowl, Bess Streeter Aldrich, Books, Christopher Paolini, Diana Gabaldon, Eoin Colfer, J.K. Rowling, Outlander, Reading, Stephen King, Stephenie Meyer, Suzanne Collins, Veronica Roth, Wheat Belly. When you begin the Hunger Games trilogy let me know. I want to read parts 2 and 3. That’s an ambitious list. Good luck! I love ALL things Bess Streeter Aldrich. I devoured 11/22/1963 in a single weekend. Let me know what you think of them! I’ve read Rim of the Prairie before and had to have it again because I loved it. My husband went through 11/22/63 quickly, too, and is dying for me to read it. I love all of the Aldrich books, I think my favorites were Spring Came On Forever, and Miss Bishop. I love those, too, and also Song of Years. The friend who turned me onto her is considering writing her dissertation in her–she has a powerful personal story behind the books.